This school has a long history! It was opened in 1835, two years before Victoria came to the throne, and all of its rooms are still used as a school. It was originally a Church of England National School, built by four leading men of the area including vicar David Owen to provide free education for children from poor local families. Most of the stone for the building came from Trefriw, on the far side of the Conwy Valley (opposite Llanrwst). Some came from a small quarry at Nant y Rhaglaw, above Eglwysbach. Lime for the mortar and plastering came from Llysfaen and the nails from Liverpool. The windows are Gothic in style, and originally the four main ones at the front were all the same size. The school’s second master (from 1837 to 1869) was Richard Beverley, who was later said to have kept the jawbone of radical writer Thomas Paine in his house until his daughter decided to give it a proper burial in Eglwysbach churchyard. 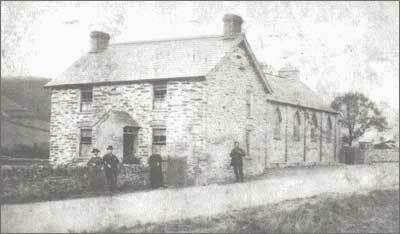 The adjoining School House was built sometime after 1861. One of the pupils around that time was Owen Jones of Bodnod Bach. The school has his exercise book from 1863. Up until 1921, when a playground was built, the pupils would play in the road at the front of the school. Lunch was eaten sitting on the bridge, a practice that continued until c.1938, when the Aberconwy Hall was used as a refectory. The meals were prepared in a small kitchen to the side of the main room. The present kitchen and canteen were opened in 1961.